The Colony’s new ballroom is expected to be completed by the end of August, according to the hotel, with events already booked for the fall. A long-term renovation, which includes multiple phases, started this summer with The Coral Ballroom, a 2,800 square-foot space that features three arched floor-to-ceiling windows and colors inspired by the beach. The room also will feature a private, hidden terrace accessible only from the ballroom. The hotel partnered with several builders and architects to design the space, according to a news release, including Kemble Interiors, Inc., architect Peter Papadopoulos of Smith & Moore Architects, Shapiro Pertnoy Companies and Jorge Sanchez of SMI Landscape Architecture. Artist Joseph Steiert paints on the ballroom floor. When complete, the ballroom will be able to be divided into three separate rooms to accommodate smaller gatherings. The ballroom also will feature white coral chandeliers. 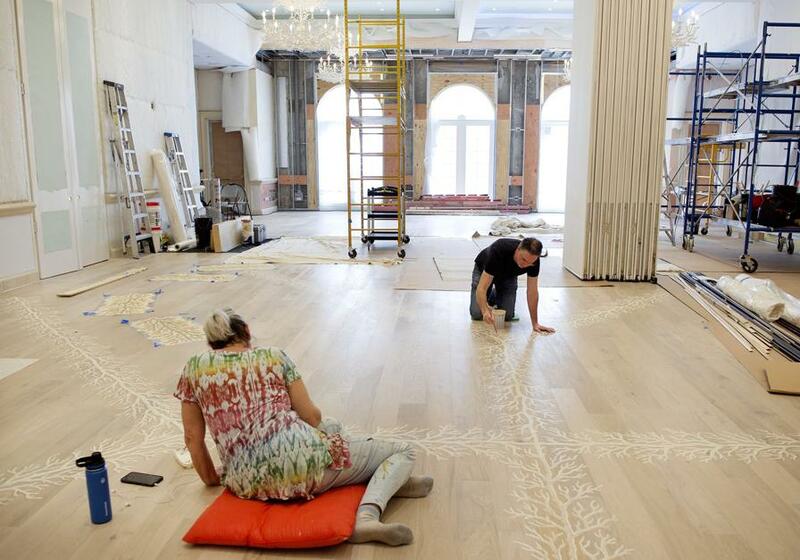 Last week, artists Alice Ludwig and Joseph Steiert were painting the white oak floor of the ballroom. Steiert, who was hired by Kemble Interiors, designed the floor’s coral pattern to echo the chandeliers. Artist Alice Ludwig works on the floor. The walls will be upholstered with cream and beige fine linen stripe. An up-close look at the painted coral pattern on the floor of the new Colony ballroom. When complete, the ballroom will be able to be divided into three separate rooms to accommodate smaller gatherings. Artist Alice Ludwig of North Palm Beach shows attention to detail as she paints the white oak ballroom floor at The Colony. According to the hotel, other phases in the renovation plans include work to the restaurant, lobby and Palm Court.